The paintings and poetry flanking the room, created by inmates at the Santa Cruz County Jail, laid a fitting backdrop for a conversation about the criminal justice system. About 80 Santa Cruz residents packed into the Resource Center for Nonviolence, across the street from the Santa Cruz Courthouse, to witness a presentation by prominent advocates of restorative justice on Nov. 1. 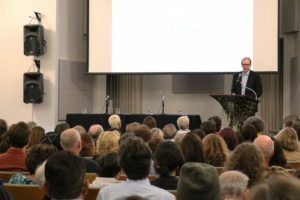 Craig Haney, a UC Santa Cruz professor of psychology with an affiliation in legal studies, organized the forum to encourage residents to consider the alternative to the traditional, punitive model of criminal justice practiced in the United States. 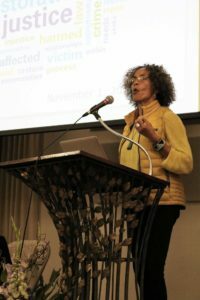 Fania Davis, a national restorative justice expert and the second speaker, stands boldly on stage voicing past situations requiring the involvement of restorative justice. Photo by Christina Bulosan. Davis grew up in the heart of Birmingham, Alabama with her sister Angela during the height of the Civil Rights Movement. Of the four girls killed in the 16th St. Baptist Church bombing in 1963, two were close friends of Davis. She said that in many ways she dedicates her life’s work to them. Today, that work centers on promoting restorative justice practices. Restorative justice is a paradigm of conflict resolution seeking to address and redress harms. This approach contrasts the westernized conception of justice through punitive and retributive harm on the offender. A restorative approach to justice is generally accomplished through a facilitated dialogue between offender and victim, with the goal of attaining mutual acknowledgment of harms inflicted and agreeing upon a remedy for those harms. Among the effects of Davis’ advocacy is the implementation of the Restorative Justice for Oakland Youth (RJOY) program. In the pilot instance of the program at West Oakland Middle School, RJOY reduced suspensions by 87 percent and eliminated expulsions and violent incidents. Teacher attrition was also reduced, and graduation rates went up 60 percent. After Davis’ talk, four additional legal professionals took the stage in a panel to share their efforts to promote restorative practices in the U.S. justice system. Among the panelists was Judge Leslie Kobayashi of the District Court of Hawai’i, who incorporates restorative justice in her sentencing. 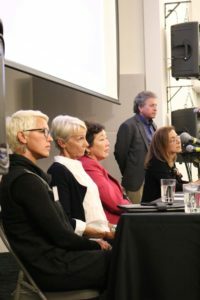 From left to right: Panelists Alaya Vautier, Lorenn Walker, Leslie Kobayashi and Katherine Weinstein Miller and John Leopold listen to one audience member’s question and comments during the Q&A section of the night. Photo by Christina Bulosan. Judge Kobayashi provides those she sentences with the opportunity to offer acknowledgment of harm and responsibility, either via verbal statement or written letter. She also encourages dialogue between victims, offenders and the families and loved ones of each. Restorative practices also have tangible organizational benefits. Katherine Weinstein Miller of the San Francisco District Attorney’s office, another panelist, spoke at length about San Francisco’s Neighborhood Court program. These courts address nonviolent misdemeanor offenses where the victim and offender meet with a volunteer arbitrator to resolve the case in a restorative manner, outside of the actual courtroom as an alternative to being charged and tried the usual way. This not only dramatically reduced caseloads in the traditional court system, Miller said, but parties involved in the arbitration program had a 91 percent completion rate. Cases resolved through Neighborhood Court are also 82 percent cheaper than traditionally resolved cases. After the panelists’ presentations, the four took questions from the audience before a final segue into closing remarks by Craig Haney. Audience members walked away with positive impressions of the event. audience member and UCSC student Luke Ready. The forum ultimately stressed the potential for restorative justice to improve community outcomes as a whole.